Separate the 3 parts and put back together ! No force needed! There’s a whole world of wisdom wrapped up in this Oskar masterpiece. The three pieces can be separated and then joined again in their original form. What’s special about this puzzle is that it can be solved three different ways, depending on which of the three pieces is chosen as the middle piece. Solving this puzzle requires an especially subtle kind of working of the pieces, the kind that often leaves the victim struggling in frustration. Keeping in mind its chainlike behavior and using your feeling to your advantage is the best way to attack this. 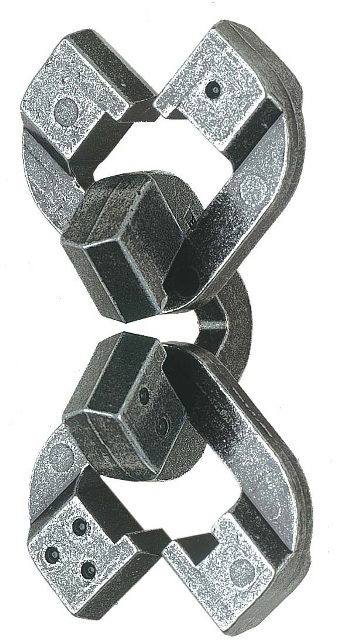 The key word is “chain.” Designed by Oskar van Deventer. 2002 Puzzle Design Competition Honorable Mention. Level 6/6. Package size: 7,5 cm x 11,5 cm x 4,5 cm. This product was added to our catalog on 29.04.2008.